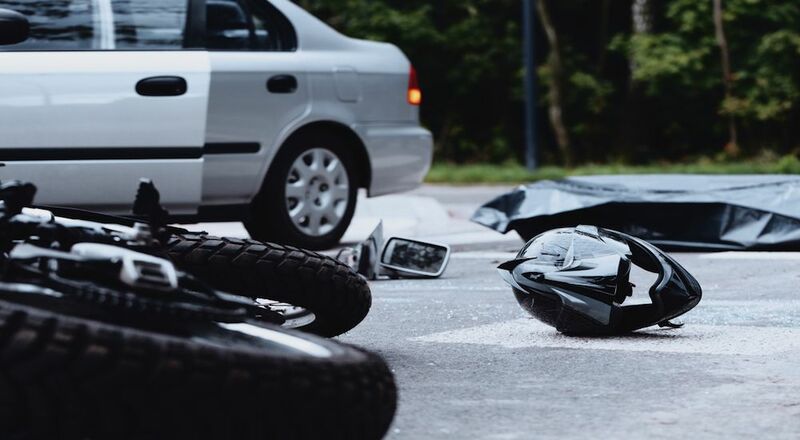 There are multiple reasons that can lead to a motorcycle accident. However, most commonly, motorcycle accidents occur as a result of the motorcycle driver not being seen by the driver of the automobile. Of course, there are other factors that can contribute to motorcycle accidents, for example, weather, road surfaces, debris on the road, etc. Whatever the cause of the accident, there are very important safety measures that need to be taken immediately after by the driver. The very first thing you should do is check to make sure you have not incurred any injuries. Keep in mind that after an accident occurs, your body will have experienced a rush of adrenaline. This rush of adrenaline can result in a lack of judgment as to whether or not you have been injured as it can mask the physical pain of injuries. Check your body to ensure that you were not affected by the accident. This is important to do so as it can be an indicator that something is internally wrong. If you find that you are injured you should remain still as you wait for the paramedics to arrive. Following checking yourself, you should report if anyone else has been injured in the accident. If you incur any injuries, regardless of the severity, it is best to have yourself checked out to make sure nothing serious is missed or overlooked. After ensuring that you and others are okay, you should take photos of the accident and all vehicles, motorcycles, etc. involved. Try and take photos before anything is moved, however, if this isn’t possible just make sure you capture photos of all the vehicle/motorcycle from various angles, including the license plates. You will need to contact the police in order for them to fill out an accident report and document the details of the scene. Regardless of the severity of your accident, it is important to alert the officials. When the police arrive, you should ask for their names and badge numbers as well as inquire about a copy of the accident report. If you are able, and as soon as it is safe, you should attempt to move your bike off of the road. Leaving it be can be a hazard for oncoming traffic. It is quite important that you exchange information with the other driver involved. You should also get contact information for any passengers or witnesses if you can. As for the other driver, you should ask for, as well as give them: full name and contact information; car make, model, color, and license plate number; their driver’s license number; and their insurance and policy number. As soon as you can, you should contact your insurance provider to make a claim. They will ask you detailed questions about the accident, so the sooner you are able to call, the better. Premier Injury Clinic of DFW is committed to providing quality health care for those injured in motorcycle accidents and more. Our chiropractic specialists are highly trained and we are conveniently located in 5 different locations in the DFW area. We conveniently offer free transportation to our patients, which we hope lessens the stress for a person who has perhaps lost their transportation abilities due to an accident. If you have any questions, don’t hesitate to contact us today.